The Book of Mormon, the Tony-winning musical from the creators of South Park, has received largely positive reviews at its West End premiere. 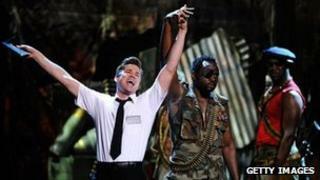 The show, which lampoons religion and musicals, has already been a huge Broadway hit. The Evening Standard called it "spirited and refreshing", while Paul Taylor - writing for the Independent - "absolutely loved it". However, The Telegraph critic Charles Spencer found it "hard to warm to". The Book of Mormon follows the story of two missionaries played by Gavin Creel and Jared Gertner who are sent from Salt Lake City to preach in a remote Ugandan village. Spencer said the show is "often damnably clever and sharp" but felt that mocking Mormons and their beliefs "is the softest of targets". But he was complimentary of Creel and Gertner, who "make a cracking double-act as the mismatched missionaries". Suggesting his three-star view "is likely to be a minority", Spencer added: "The Book of Mormon strikes me as a decadent and self-indulgent musical, and its mixture of satire and syrup ultimately proves repellent." Trey Parker and Matt Stone, best known for their animated series South Park, spent seven years working on The Book of Mormon, which opened on Broadway in March 2011. The book, music and lyrics are by Parker and Stone, who worked alongside Robert Lopez, co-creator of the musical Avenue Q.
Parker also co-directs the show with Casey Nicholaw, "with terrific zap and zestful precision", according to The Independent's Paul Taylor, who awarded the show four stars. "The show thwacks together a caricature-tendentious view of modern Mormon masculinity with a calculatedly outrageous Lion King-skewed view of Africa," he said. Taylor called leading man Creel "brilliantly engaging" as Elder Price, while Gertner "is totally adorable as his not-so-forlorn sidekick". The Book of Mormon, which contains strong language and jokes about religion, Aids and female circumcision, won nine Tony awards last year. The West End show at the Prince of Wales theatre is sold out until the end of July, with a small number of daily tickets available via a lottery system. Writing in the Evening Standard, Henry Hitchings gave the show a four-star review. Like Spencer he agreed that Mormonism was a "soft target", but Hitchings found creators Parker and Stone "true to form" with a show that is "packed with moments of startling profanity". Media captionReaction to the opening night of Book of Mormon. "It is rich in absurdity and ecstatic weirdness - and has been imbued by [its] co-directors...with athletic zing, precisely delivered by a cast that includes sharp supporting turns from Giles Terera, Alexia Khadime and Chris Jarman. Hitchings is equally positive about lead actor Creel who "brings a taut energy to his role as the square-jawed Elder Price", and Gertner, who he described as "adorably goofy" as Elder Cunningham. Less positive was Michael Billington writing in the Guardian who found the musical "mildly amusing" and awarded it three stars. "I had a perfectly pleasant time, but the idea that the show...is either daringly offensive or a Broadway breakthrough is pure codswallop," he wrote. "For all its rude words, this is essentially a safe, conservative show for middle America. "I should add that the show is efficiently directed by Nicholaw and Parker, and offers a perfectly decent night out. What it lacks, though, is the courage of its own convictions," he said. Video Crowds give a warm reaction at the opening night of the Book of Mormon.